Sandra Averhart speaks with Greg Evers and Matt Gaetz, both of whom have been reelected without opposition. 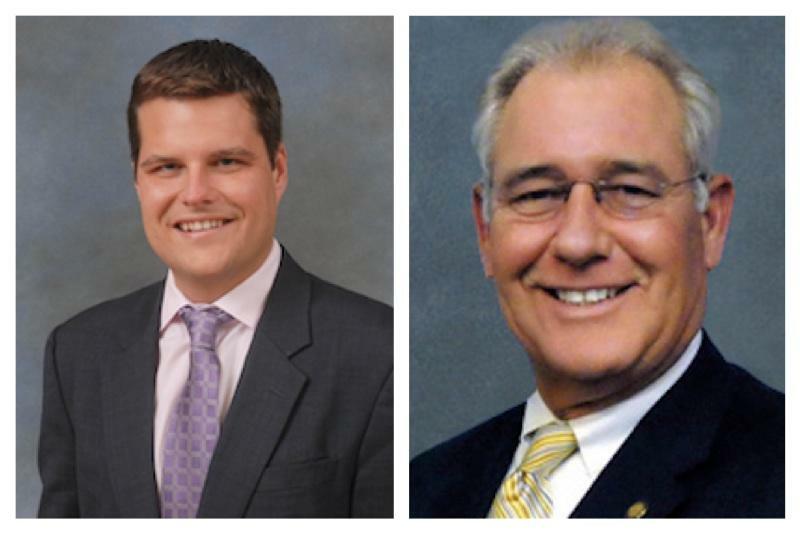 Matt Gaetz and Greg Evers, both returning to the Florida legislature without opposition. Evers was first elected to the state senate in 2010, at that time defeating Republican newcomer Mike Hill for the seat left open by Durell Peaden due to term limits. Evers had previously served 10 years in the House of Representatives. Looking at some of his accomplishments as a senator, Evers says he’s most proud of his work to protect Second Amendment rights in the state of Florida. “That’s one of the biggest things that I have done from Stand Your Ground to firing the Warning Shot that was approved this past session, as well as the castle doctrine,” says Evers. Also approved this session - and signed by Gov. Scott - is the so-called “Pop Tart” gun bill, sponsored by Evers. The measure prohibits schools from disciplining students who play with simulated weapons. Evers also noted his efforts to ensure Florida provides military funerals for indigent veterans in the state AND to prevent EBT or food stamp fraud. Additionally, he says was pleased to contribute to this year’s passage of stricter sexual predator laws. But, many of the bills introduced by Evers have failed to win approval or even get a full vote by the Senate. He says in the coming term he’ll focus on getting more funding for road projects in the region and on legislation that will create more jobs for residents in Northwest Florida. District 4 State Representative Matt Gaetz also was re-elected without opposition. Gaetz cites plans to pursue legislation focused on improving the delivery of educational services to developmentally disabled people in the state. “Either our developmentally disabled population will be taxpayers or they’ll be tax burdens and I think it’s one of the places where government can move the needle the most,” says Gaetz. Gaetz adds that in the coming term, he’s interested in more legislation focuses on entitlement reform in Florida. For example, he’d like to review the food stamp program in Florida and overhaul the state’s Temporary Assistance for Needy Families or TANF program, which provides temporary cash assistance. Like Evers, Gaetz had high profile legislation to be approved during the last legislative session. Most notably is the Compassionate Medical Cannabis Act, which for the first time legalizes the use of medical marijuana in Florida. Starting in November, Matt Gaetz, the son of outgoing Florida Senate President Don Gaetz, will begin serving his third two-year term. He was first elected to state office in April 2010, defeating a crowded field of candidates in a special election to succeed Ray Sansom, who resigned from the District 4 seat due to corruption charges. Gaetz was subsequently elected without opposition in the 2010 and 2012 general elections, and is moving on without a challenge this year. But, Gaetz says that doesn’t mean he won’t be on the campaign trail. “I’ll be campaigning hard for my colleagues in the state house and also Gov. Scott, because in many ways, the things I want to accomplish are in line with his views. And, so if we have a governor that doesn’t share my views or the views of the people in my district then it would be hard for me to effectively represent them. So, I expect to be very active during the campaign season,” he says. Locally, Gaetz will be stumping for the re-election of Republican incumbent representatives Clay Ingram in District 1 and Mike Hill in District 2. Ingram is being challenged by Democratic political newcomer Gloria Wiggins-Robertson; and Hill will again face off against Democrat Jeremy Lau. Both races will be decided in the General Election on November 4, 2014. The community action group Movement for Change has been a fixture in Pensacola since the 1990's; officially established in 1997. Led by activist Leroy Boyd, who died in 2010, their original mission was the renaming of Pensacola’s Alcaniz Street in honor of slain civil rights icon Dr. Martin Luther King, Jr.
Over the years, members of the organization have tackled numerous social justice issues, ranging from disparities in education, law enforcement, and the voting process. Gov. Rick Scott touted Florida's improving economy in his fourth State of the State Address, which also made a case for re-election as much as it laid out his plan for the final year of his first term. Any doubts that the 30 minute speech would also serve as the unofficial kickoff to Gov. Scott’s re-election bid were dispelled right out of the gate. The Republican referred to the economy under predecessor Charlie Crist – without mentioning the former Republican who is now running for governor as a Democrat. “Florida was in a hole. Unemployment was around 11%,” said Scott. One of the issues the legislature will take up in this year's session is Performance Based Funding for Florida's Universities. And, if implemented, the system could cost the University of West Florida a lot of money.